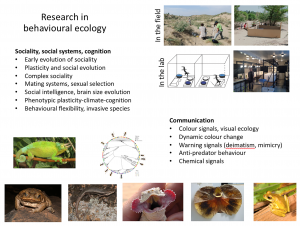 Research in the lab is broadly focused on behavioural and evolutionary ecology, for which we use lizards as a model system although we have also studied mole-rats, snakes, cichlids, tree frogs and cane toads. Currently, we are focused on three major themes: 1.) animal communication; 2.) cognition; and 3.) sexual selection, social behaviour, social organisation, and understanding the early evolution of sociality in vertebrates. Here is a one-slide representation of our research in the lab, which is both field and lab-based. In the context of animal communication, our interest lies in the design and information content of animal signals, particularly colour signals, and their role in fitness. For example, we may ask what information a male’s colour signal conveys about their quality to a female or about their competitive ability to a rival male. Similarly, we also work on male chemical signals and their role in sexual selection. Recently, we have been working on colour signals that are naturally selected and which appear to act as a deimatic display to a predator. Deimatic displays are almost completely unstudied in lizards. We have identified potential deimatic displays in independently evolved lizard clades in Africa, Asia and Australia that have high UV reflectance and are working to understand the proximate and ultimate factors that may be driving their convergent evolution. We are also working on the evolution of complex, dynamic tail waving in Australian dragons and Asian toad-headed agamas. In these systems, we are taking a comparative approach to understanding how elements of courtship and display behaviour have evolved as a result of phylogeny and/or environmental factors. A second theme in the lab is cognition and brain size evolution. We are investigating aspects of cognition such as spatial learning and whether this links to alternate reproductive tactics and personality in water skinks (Eulamprus quoyii). We also ask whether cognitive ability is domain-specific or general. In other words, do lizards that perform well in a one cognitive domain such as a spatial task also perform well in an unrelated cognitive area such as an instrumental task. This is a key question in cognitive ecology, which relates to behavioural flexibility. Another major focus is testing the social intelligence hypothesis for the evolution of large brain size. This is a large-scale project taking a comparative approach to testing whether social factors have driven brain size evolution in the Egernia group of lizards. Egernia are a novel system for examining how sociality may have acted on brain size because some species live in multi-generational family groups while others are solitary and they thus represent an alternative to previously studied mammal and bird models. Finally, we are using the family-dwelling, social Australian Egernia-Liopholis clade as a model system for uncovering the mechanisms that might have driven the early evolution of monogamy and sociality. Ultimately, we are interested in investigating the possibility of a general theory for the evolution of vertebrate sociality. Variation in social behaviour and social organisation in lizard systems are therefore of great interest. This is a collaborative project with multiple labs in Australia.